Research In Motion (RIM) on Monday announced plans to release BlackBerry Desktop Software for the Mac in September. Details about how the software looks and operates have been posted to a developer’s blog on the Inside BlackBerry Web site, an official blog maintained by RIM. 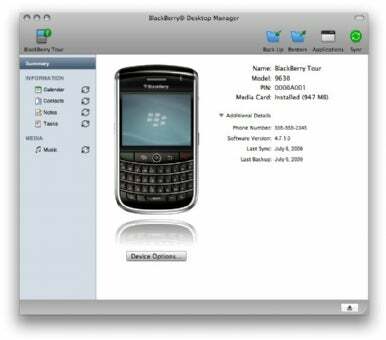 BlackBerry Desktop Manager will give BlackBerry users a first-party solution for syncing their BlackBerry to their Mac. The BlackBerry — still a popular choice with many IT professionals and corporate employees — comes with software that enables you to synchronize content between a PC running Windows and the device. Third-party software exists for the BlackBerry to communicate with the Mac, including The Missing Sync from Mark/Space and PocketMac for BlackBerry, which RIM provides for free to Mac-using BlackBerry owners. The BlackBerry Desktop Software for Mac will feature the ability to synchronize iTunes playlists, calendars, contacts, notes and tasks. It will also enable users to add and remove applications from their BlackBerry devices, update those devices when new software becomes available backup and restore device data, and perform automatically scheduled backups with encryption. What’s more, the software will be able to manage multiple BlackBerry devices from a single computer. BlackBerry users interested in getting notified when the software is available can sign up on the BlackBerry Mac Web site. In December, RIM released a “preview” of BlackBerry Media Sync for Mac — software that enabled some BlackBerry devices to synchronize music with the Mac and iTunes.